At least fourteen ships are engaged in battle. Dark smoke billows up from the surface of the water on the left horizon line, spreading to either side of the sky and obscuring the entire top of the print. 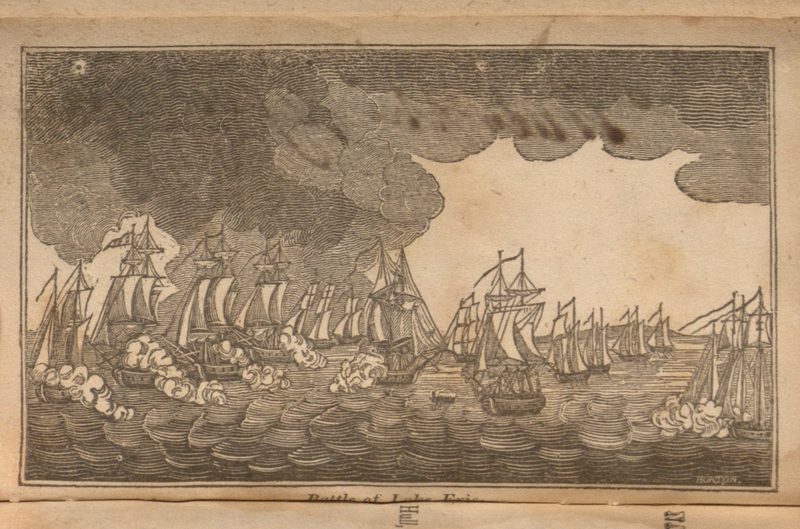 The horizon is low in this image, much like the horizon in Thomas Birch’s Battle of Lake Erie.The ships spew white puffs of cannon smoke toward their opponents; each side is clearly defined. There are no flags to identify the ships’ nationality. There is one row boat near the center that (according to the accompanying text) probably contains Commodore Oliver Perry. This text, “Perry’s Victory,” speaks of Perry leaving the disabled Lawrence and rowing towards the Niagra; coming aboard, he flies his flag and leads the rest of the fleet to victory over the British. In the bottom right corner: "Horton"
This image was the title page illustration for The American Naval and Patriotic Songster (1831). The Battle of Lake Erie and its accompanying text, “Perry’s Victory,” depict this battle, fought during the War of 1812. In this battle, the ships of Commodore Oliver Hazard Perry captured an entire British fleet. Such victories contributed to the development of national pride and identity in the United States (Stein 27). This important battle is referenced in the accompanying text, “Perry’s Victory"; a definitive British victory that brought an initial end to the Napoleonic wars, it was fought between the British Royal Navy and the French naval forces. Lord Nelson, a great British commander, lost his life in this battle. The event of his heroic death and the several victories within the battle “became the great icons of British self-esteem, and accordingly the subject of many works of art” (Tracy 182). The introduction to The American Naval and Patriotic Songster (1831) was written by "Jolly Tom" in Marine Hospital, a hospital for disabled seamen near Norfolk, VA. This painting depicts Oliver Perry boarding the Niagra during the Battle of Lake Erie, after which he would go on to lead the Americans to victory (Stein 28). What cheer, my Hearties! And how wears the world, messmates? ‘Tis the first time JOLLY TOM sends out his intended yearly cargo of Naval and other ditties, to cheer the hearts of all true TARS, and commemorate the gallant exploits of our brave countrymen. Why, now, here am I, old Tom, who have fought the enemy, yard-arm and yard-arm, and lost a pin in the service of his country. I am now laid up at Gosport Moorings, blessed with health and content, my children happy and my dear native land sheltered with Peace and Plenty—Why, now, messmate, what should an old fellow of 73 do, but, as the song says, “Tell old tales and chaunt of brother tars?” What signifies palaver, or argufies boasting; I was one of the lads that drank success to my country in the TOP of the TEA SHIP; my eyes, how we queered the lubbers! It was a daring business, but we were the lads that did it, and what can’t a Yankee sailor do?—When his country wants him, he’ll fight till the last glass, and sooner sink than run. All pant for glorious victory. o win a wreath of victory. The path that leads to victory. To grace the bold Niagara. And flash their red artillery. And rend the vaulted canopy. Huzza! The tide of battles turns! To strike to great Columbia. This image depicts the Battle of Lake Erie, a major event and significant victory for the Americans during the War of 1812. Marine. Seascape. National pride. Battle. This image makes detailed use of smoke, shadow, and scale to emphasize the courage of the Americans and the justice of their cause. The "thundering artillery" of the song is depicted in the black mass of smoke that rises to tower over the battle, threatening to swallow the entire scene. The shadowed appearance of this smoke, most of which rises from the British fleet, emphasizes the destructive power of the enemy's artillery, and the highlighted smoke spewed by the cannons suggests the remarkable speed of the firing (the “flash” of the “red artillery” described in the song). The fact that the British fleet emits the majority of the smoke enforces the image of Britain as the arrogant aggressor; the American fleet, in contrast, fires much less smoke, and its status as just, wronged defender is enhanced by the American coastline in the background. This impresses upon the viewer the courage of Perry, scarcely visible, standing in the small row boat as he escapes a sinking ship to fight from the quarterdeck of another. The incredibly small size of the boat and the tiny figure of the man are menaced not only by the towering clouds, but by the depths of the lake at the bottom edge of the image; this shadowed deep participates in the same, threatening presence as the blackening smoke. Consequently, these shadows not only serve to give the painting a certain natural balance and to draw the eye to the lighter center of the image, but, more significantly, they draw a parallel between the hostile banks of smoke created by the British fleet and the unknown depths of Lake Erie. This emphasizes the power of Britain, the desperate situation of the American fleet, and the valor of the Perry, who manages to lead his ships to victory while caught between the threat of human destructiveness (the smoke) and the immense, unknown elements (the water). The entire image, then, emphasizes the tremendous effort and courage necessary on the part of the Americans to overcome desperate odds. This corresponds to the theme of the accompanying song: "Perry's Victory" dwells on the unlikelihood of the American victory in order to celebrate the ultimate triumph of the just cause, the defense of "freedom and sailors' rights" eventually overcoming the sordid British lust for "naval glory". Stein, Roger B. Seascape and the American Imagination. New York: Potter, 1975. Print. The American Naval and Patriotic Songster. Baltimore, 1831. Print. Tracy, Nicholas. Britannia's Palette: The Arts of Naval Victory. Montreal: McGill-Queen's UP, 2007. Print. Without music; a few tunes indicated by title. Alphabetical Contents by first line: p. -256. Spine title: American Naval Songster. The preface gives the compiler's name as “Jolly Tom,” an old sailor in Marine Hospital, Norfolk, VA.